Dollar Shave Club is a razor and grooming supplies subscription service that allows you to choose the frequency of your deliveries and cancel at any time. They promote themselves with high-quality products at affordable prices. This is a review of their Shave Starter Set for $5.00. COUPON: Get your first Starter Set for $5 plus free shipping with this link! The Products: Razors and Grooming Supplies: Shave, Shower, Hair and Skin Products. You decide which products are in every shipment. Dollar Shave Club has their own little newspaper that changes content each month. I actually found this one to be pretty interesting! There’s also an info card about their oral care line, Superba! As well as a plethora of their other grooming products. There’s yet another pamphlet with testimonials and a quick overview. Dollar Shave Club has three choices of handles that go with three different choices of blades. This is their most expensive handle and is made of mostly metal with blue and grey plastic and rubber accents. It coincides with their 6-blade razor cartridges which is the most you can get. It has a pretty hefty weight to it and looks sort of like a transformer. When you get your first delivery, the handle comes separate from the blades and you’ll attach them as seen above to get your first shave going. There’s a button to eject old blades once you’re done. The underside has some silver rubbery grips going on so it won’t slip out of your hand in the shower. A closer look at the razor cartridge reveals six blades and a small yellow aloe strip at the top and a blue rubber strip at the bottom. As you can imagine, 6 blades really give you a ridiculously close and smooth shave. No nicks were had on my legs using this heavy handle and even though I don’t love the design, it feels good in my hand. The next item is your pack of blades. DSC has the most minimal packaging of all of the shaving clubs I ‘ve seen. A plastic tray containing your 4 cartridges slides out of a cardboard sleeve. It’s easy to just stick the handle in, and remove to change the blades. The last item you’ll receive in your shave kit is a travel size of their Easy Shave Butter. When I first tried this stuff, I fell in love. It has slick packaging, is really smooth on the skin, and has a nice scent that isn’t super masculine. I ended up reordering this many times since the first time I tried DSC over a year ago. It’s packed with cool stuff like golden barley, organic prickly pear cactus, Pacific sea algae, black willow bark, oat extract, and vitamins A, E, and C. Not too shabby! Verdict: I’ve always been a fan of Dollar Shave Club but now that other brands are popping up and marketing towards women specifically, I can’t say I’m not tempted to switch. They do a good job of catering to everyone since they know many women use their products as well, and they’ve been around the longest so I want to stay true. They’re packaging is minimal and they are all about no-frills but they do happen to have a lot of paper that comes with their deliveries which seems a little unnecessary. They’re 6 and 4-blade cartridges are both amazing to shave with and they have an overwhelming amount of products you can add to your subscription which cuts down on trips to the store, but I also have other brands I go-to for oral care, grooming, etc so for me, the shave butter is all I’ll ever use. Can you still get this box if you sign up today? Yep! You can order this anytime! Their promos change often though, so order now to get the current $5.00 deal. 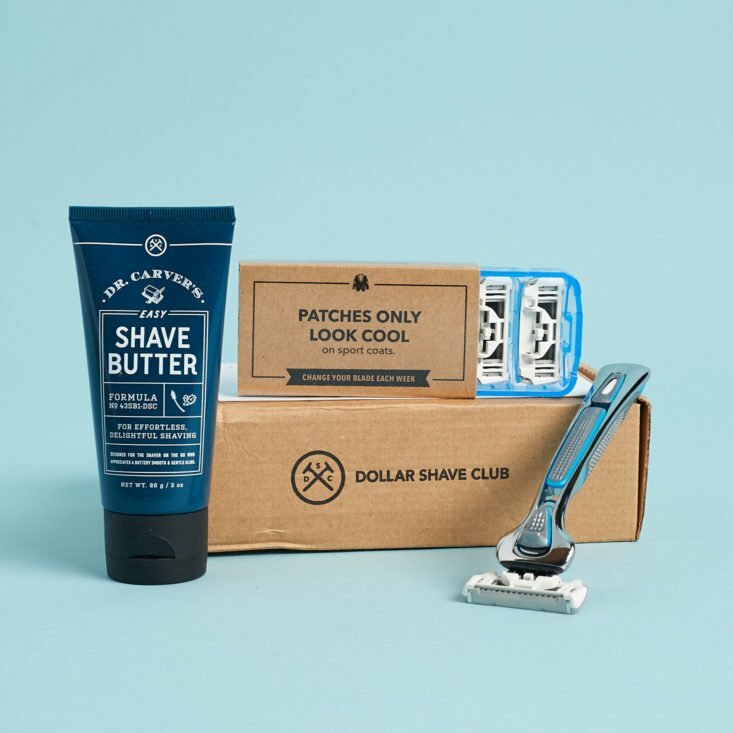 Check out all of our Dollar Shave Club reviews and more grooming and personal care boxes in the Men’s Subscription Box Directory! If you’re trying to figure out which razor subscription is right for you, head over to this post where I compare the leading brands! Have you tried Dollar Shave Club? How do subscribers rate Dollar Shave Club? Do you subscribe to Dollar Shave Club? Add your rating now! If you want to buy the blades direct from the manufacturer that supplies DSC, you can always check out Dorco USA. They ship super fast and have sales all of the time. They also have a decent amount of razors more geared to women on that site. I’ve been subscribed to the dollar shave club for at least two years now. And I really appreciate them. My razors last me quite a while because I only need to shave about once a week so I only have them send me a box about every 3 to 4 months or sooner if need be. It’s nice seeing that they’re adding new products. Marne great review I always love reading all your reviews, all your team mates are excellent also. I am interested, but want to ask anyone whose household gets these: Do you really have to change the head every week like they recommend? This would be for a woman’s legs, not for a man who has to fight the beard every day. What do you think? I use this razor and I still would say depends on how much you use it. I personally receive razor ever two months and I changed to the 4 blade. They also raised the price. I don’t know why that wasn’t in the review. I’ve found that even with very frequent use i still do not need to change blades weekly. I think maybe every two weeks is the most, however generally every three weeks or so. The blades really retain their sharpness quite well. So well that I have a nice stash of replacement blades waiting. They more recently began allowing how often you receive your replacements. I have at least temporarily changed mine to every three months (to allow me to use what I have in hand) but most likely go to every other month. Thank you so much Jennifer and Patty! Dollar Shave Club vs Billie vs Harry’s—Which Is the Best Razor Subscription?